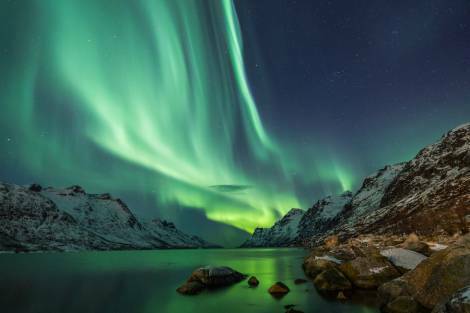 Home » North Norway, Northern Lights & Whales! North Norway, Northern Lights & Whales! PLEASE NOTE: All itineraries are for guidance only. Programs may vary depending on local ice, weather, and wildlife conditions. Flexibility is paramount for expedition cruises. Willingness to compromise on comfort is a basic requirement on board a historic sailing vessel. Important information about the sailing program: The boat is equipped with sails to be used in good conditions (based on open sea, water depth, wind, and time). This is not guaranteed. The captain decides whether to use the sails or the engine. There is no claim to one or the other propulsion method. If sails are used, the crew operates them. Guests must follow the safety instructions of the team. The average cruising speed for s/v Rembrandt van Rijn is 6 knots. Highlights you might experience: Northern Lights & Whales! s/v Rembrandt van Rijn - Our 3 mast-schooner 'Rembrandt van Rijn' is well suited for expedition cruising among the fjords of Greenland and Spitsbergen. Your adventure begins in Tromsø, nicknamed the “Paris of the North,” located in an area rich with Norse and Sámi history. Enjoy exploring this sub-Arctic Norwegian town, said to have been inhabited since the last ice age. Early in the morning, you depart from Tromsø. The itinerary depends largely on the weather conditions, the amount of daylight during the voyage, and the expected location of the whales. You might sail clockwise or counter-clockwise around the island of Senja. You spend the next several days along the north coasts of Senja and Andfjorden, areas where many whales have been spotted in recent years. Keep a look out for sperm whales and other whale species here. Near Andenes, along the edge of the continental shelf, whales dive particularly deep to feed on giant squid. You may also see white-tailed eagles, one of the largest birds of prey in Europe, vying for their share of the herring. In the afternoon, you find a place for the night in one of the scenic fishing villages nearby, such as Skrolsvik, Andenes, Gryllefjorden, or Sommarøy. Once the sun has set, you can make small hikes along the coast – and maybe even catch sight of the aurora. Please inquire for available dates, rates and trip info.